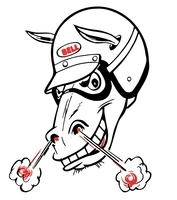 You have a couple different options to customize your Bullitt helmet. The Bubble shields add a cool, retro look and the Flat shields have a more sleek look (see the related products below). Whether you choose a Bubble shield or a Flat shield, you will need to get it with the proper color leather tab (unless you want to go wild and have one that contrasts). The leather tabs on the shields match the color of the helmet’s interior. Here’s the breakdown on which color helmet has a brown interior and which has a black interior. 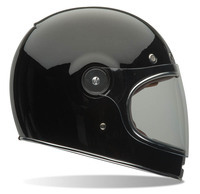 Customize the look of your Bullitt helmet with these cool, retro looking Bubble shields.